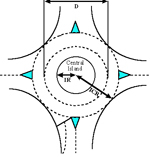 Roundabouts, like a Thelonius Monk solo, lead in opposing directions. A static landmark promising movement but caught in a never-ending loop of repetition and angular tangents. William Crain’s new compilation tape piece reminds me that I should get round to doing a driving compilation tape. I’ve been subjecting my aging car stereo to endless bouts of Elizabethan Consort music by Peter Phillips, which happens to be both mournful and stirring, an aide to concentration and upliftingly rhythmic. High on the playlist would have to be Georges Moustaki’s version of 'Aguas de Marco', to continue William’s theme, which is burnished by Moustaki’s trademark gravel(l)y French delivery. You can feel the bristles of his beard up close and personal with the microphone. Another candidate for the tape would be the Colorblind James Experience’s 'Considering a Move to Memphis', which I rediscovered this week. Much more subtle than I remembered it being 15 (!) years ago, lilting vibes and a deader-than-dead-pan Jarmusch delivery give it a fantastic undercurrent of nostalgic resignation. Nostalgia being a double-edged sword of course. I’m all for projects which help wake to the potential in the most unlikely daily routines or landmarks. An unlikely candidate for stocking filler of the year, then, comes courtesy of Kevin Beresford and his chums at the Roundabouts of Britain collective. They have already produced a full-length book collection of photos of the blessed things, proving that you can’t ignore them, however hard you try, and that every English town has its fair share of examples. Beginning with a calendar tribute to the stationary circular traffic landmarks of his home town Redditch, Beresford has expanded recently and taken his camera further afield, until reaching my beloved Letchworth Garden City. Roundabouts of Letchworth (local fusty guardians of privilege will decry the lack of Garden City in the title, but no matter) is a classic example of English heritage captured through the most mundane but quintessential details. Letchworth being home to the very first roundabout, and where I needed five attempts to pass my driving test (failing all the first four approaching, exiting or philosophically contemplating roundabouts). The new calendar strikes up a quirky dialogue between the levels of pretension in roundabouts as sign systems as well as devices for ensuring traffic flow. Roundabouts come in a variety of sizes and have a visual impact of varying magnitude. There is the simple painted circle or bull’s eye-style road marking signalling the entry to the Kristiansand Way or Quinn Way new-build developments, as bland, some might say, as the spiral of detached executive residences beyond it. Or the far grander design and architectural ambition of the Pixmore Way roundabouts or the magnificent Sollershott Circus, featured on December’s page. The uniqueness of the calendar is of course in capturing a snapshot of daily life, showing how urban design is nothing without a context to frame it in. Here the framework includes solitary old men passing the time, a florist’s van captured on the move, a council worker caught at work tending his beloved patch at the heart of a Pixmore Way traffic island. These images could very well become nostalgia pieces in years to come, and contribute to a dialogue between past and present which is lacking from the more condescending tone of the Idler’s Crap Towns series. It’s a shame it won’t be until December next year that I can show off Sollershott, the aesthetically exquisite first roundabout, to my work-mates. It stands as a reminder of the things we take for granted when driving, cycling or absent-mindedly ruminating our way through town spaces. But it also sets a standard by which other towns fall far short. A roundabout as an oasis of calm around which parade the sights, and unsightly trail, of eager drivers making their way with varying degrees of respect for the Highway Code. Driving through rainy Stevenage this morning towards Six Hills Way the sight of a high-rise office block beyond the roundabout displaying the sign OFFICES TO LET had a particular poignancy which I wish I had caught on camera. Godard would have been justified in letting his camera glare at the grimy monochrome bleakness of the scene, and there are some marvellous locations for a future remake/sequel to Alphaville in Stevenage. The abandoned derelict Manulife building (a shudderingly ironic name!) for instance. It’s what black and white film stock was made for, to a soundtrack of Moustaki rasping through Jobim’s 'Aguas de Marco'. And a hint to Kevin and co that a calendar of Stevenage roundabouts would certainly make for interesting discussion! Roundabouts of Letchworth, along with the other towns featured in the Roundabouts series, can be found at www.roundaboutsofbritain.com And yes, Alistair, there is a Roundabouts of Exeter!